The MiniMag Intelligent Reader delivers exceptional performance in an intelligently designed housing. It can read up to 3 tracks of magnetic stripe card data regardless of swiping directioin or speed that increases usability. 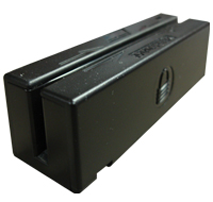 MiniMag’s compact footprint is ideal for POS, Security, Loyalty and other applications where space is limited. User Friendly Configuration Software which is capable of editing and formatting data such as dividing, rearranging, and editing fields of magnetic card data with just a click of a button.